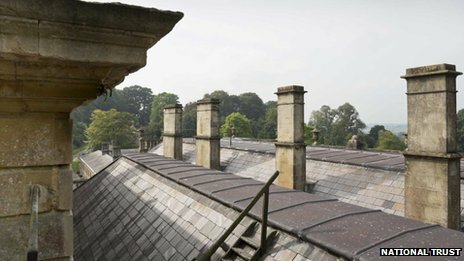 The National Trust has begun a fundraising appeal for extensive repairs to the roof of Grade I listed Dyrham Park mansion. Currently there are plastic buckets catching leaks and the Trust estimates that it needs to replace 22 tonnes of lead and 8,000 Welsh slates, at a cost of £3.5m. The appeal aims to raise £500,000 with £3m already found by the Trust. “Up to 90% of the joints in the roof are leaking now, and patch repairs will just not work much longer,” said Eilidh Auckland, Dyrham Park house and collections manager. “Luckily, the timbers below the roof are currently in a salvageable state, but if the roof is left for much longer, these will also start to decay, threatening the important collection below. Dyrham Park was built between 1692 and 1704 by William Blathwayt who was the principal colonial administrator of his age and Secretary at War for William III. It houses an important collection of Dutch Delftware, 17th-Century Dutch paintings as well as rare leather wall hangings and tapestries. All smoke and mirrors at Edwardian loos!